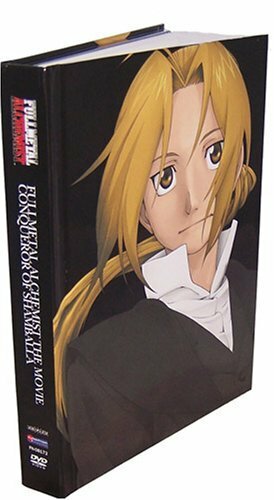 Based on the popular anime series, the full-length animated feature, Fullmetal Alchemist: The Conqueror of Shambala, picks up the action in pre-war Germany where Edward Elric, stripped of his alchemical powers, is transported to a parallel world. While his brother Alphonse struggles to find a way to bring Edward back, Edward teams up with a young scientist, also called Alphonse, to research rocketry and also find a way home. But a chance encounter with a troubled gypsy girl sets in motion a series of potentially cataclysmic events that threaten the very fabric of both worlds! Approximate running time: 105 minutes. This limited edition comes with a 64-Page hardback book, ten 5x7 portrait cards, and a bonus DVD with extras and The Making of Fullmetal Alchemist: The Movie. Bonus DVD Features: 54 Minute Interview with Japanese Cast and Crew, 3 Audio Commentaries, 2 Japanese Staff Commentaries, US Staff Commentary, Extended Trailer. If you have any questions about this product by Funimation Prod, contact us by completing and submitting the form below. If you are looking for a specif part number, please include it with your message.